It's been difficult trying to think about how to describe Aaron Starmer's The Riverman because I loved it so much, maybe too much. This book feels like my literary soulmate and I can't help but gush over the way it consumed my life while reading it. If I'm being honest, I probably could've finished this book in a day, but instead, I savored it for thirteen, leaving less than a hundred pages for more than a week. I even told my best friend that this was quite possibly the best written book I've read all year. He couldn't really believe me and waited till I was done to confirm such admissions. But yes, I still agree. The book begins in a haunting sort of way, noting that "every town has a lost child." Thessaly, NY is just like any other town in that they too have a lost child and the narrator, Alistair Cleary, remembers finding him long, long ago. And while our twelve year old narrator begins to tell us his story, or rather the story of Fiona Loomis, there is a sophistication to his storytelling that is at times stark and unsettling. Going back to my journal now, there are twenty-eight quotes that I recorded to try to preserve my memory of this book. 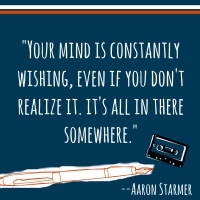 And in a way, I think this is what Aaron Starmer would want his readers to do, creating, in essence, their own Aquavania's; their own stories, their own worlds. Starmer is a storyteller. There's no denying that. That is why this book is so powerful. You can feel how important stories are because Alistair believes in them, Fiona believes in them, and so do I.
I'm not sure if being a writer made me love this book more. There's a very good chance that's true. But I think young or old, this book will appeal to anyone. The times seem simpler in this book, a late eighties landscape filled with kids riding bikes and that small town feel that even living in a small town now, I don't quite have anymore. But with this simplicity, comes a kind of terror. Without technology, what happens when children just disappear? Sure today children go missing all the time. Some are never found. But many are because of the technological advances we have. Without that technology, I felt terrified of this world that Alistair and the other characters inhabited. I felt scared for them. Even amidst detailed storytelling, I still had a difficult time discerning between fact and fiction, which also scared me. For a book that I believed to be fantasy, ready to be swallowed up by rivers and men who feast upon it's children, I did not doubt Fiona. But Alistair did, leaving me torn between them. Alistair says, "stories taunted me. Even ones I didn't believe dared me to see them through the end." I know this to be true both in my life as a writer, but as an avid reader as well. And I was hooked throughout this whole book. While some of the quotes resonated with me from a storytelling aspect, there were others that simply broke my heart. Admissions of guilt, of betrayal, of love; all of them broke me. And I've had a hard time untangling myself from this world. I can't wait to see how this continues in the next two books of the trilogy. Until then, I think I might still be obsessing over the beautifully written words from this book. That's the thing about being a writer. I don't think it works if you don't absolutely love words. I could stare at some of these sentences all day. Lines such as: "I got my inspiration from the things in life that I feared to be true and the things in life that I hoped to be true," or "your mind is constantly wishing, even if you don't realize it. It's all in there somewhere," and "the meaning of a memory can change, even when the details remain the same," and even "but for today, let's pretend. For today, let's believe that anything is possible." One sentence I just can't forget does not come from Fiona or Alistair. I won't disclose who says this in case you want the mystery: "Maybe someday you'll realize that goodbye can often be the best thing. Even when you're crazy about the person." This quote meant so much more after I finished the book because I really felt like I was saying goodbye to some of my favorite people. I'm going to miss Alistair so much, yet knowing that he lives within the pages of this book made saying goodbye easier. I know we'll meet again soon. Starmer's writing style is lovely and lyrical and never downgrades the beauty of the English language because it's written for children. If anything, this book is more important because it's a children's book. I think our world needs more books like this to prove that children's literature, as well as young adult literature, is just as important as the classics. I urge all of you to read this book this year. Whether you like contemporary fiction or fantasy, this book will appeal to you! So put this at the top of your list and I know your year will be great! May have to check this book out! !